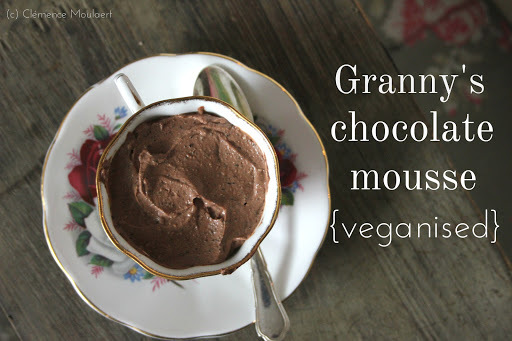 I know you’re probably pulling a face at the thought of making chocolate mousse with tofu, especially if you’re a newbie vegan/vegetarian/curious omnivore. Please don’t be freaked out by this idea. Sure, my granny would call this blaspheme, but to save the animals of this planet, a girl’s gotta do what a girl’s gotta do. So, tofu. I promise you can’t even taste it. Choose some rich, good quality dark chocolate and the sweetener of your choice (agave, maple syrup, even stevia if you want a low-sugar option), and they will overpower the soy flavour of tofu. You have to try it to believe it. 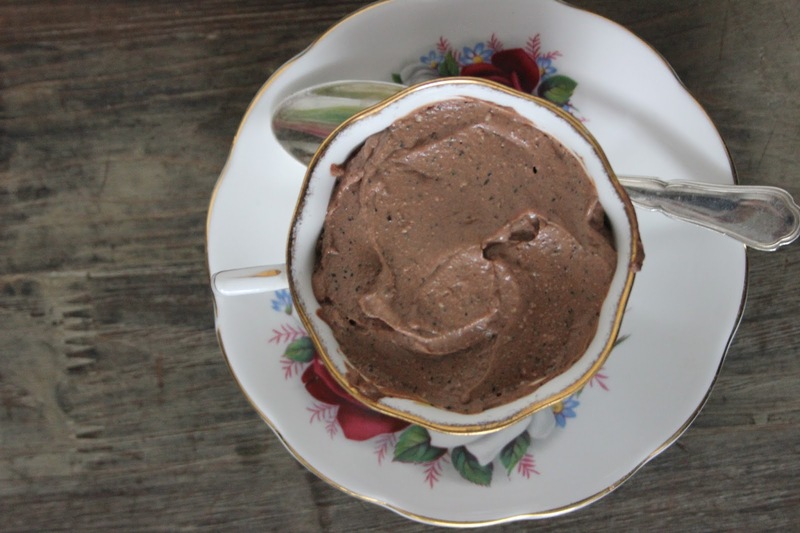 For a grown-up variation, use espresso dark chocolate. The result is simply divine. This one is my personal favourite because it comes so close to what my granny used to make for me. The tofu creates that airy texture that she always got by folding beaten egg whites into the chocolate mixture. Firstly blend the tofu and maple syrup in a food processor (or blender) until smooth. If your processor/blender is struggling, help it along by scraping down the sides with a spatula and add an extra drizzle of sweetener. Gently heat the soya cream in small saucepan until it just starts to bubble up. Lower the heat, add the chocolate, and stir with a wooden spoon until the chocolate has melted into a glorious dark sauce. 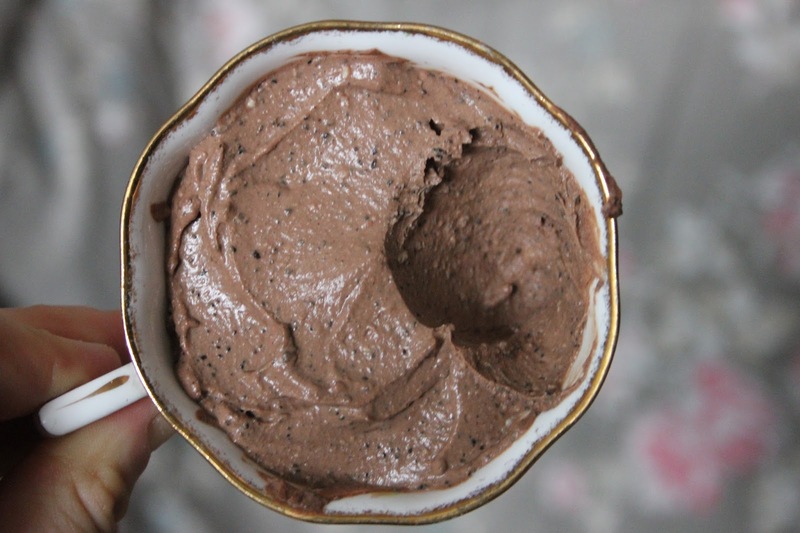 Pour the chocolate into the processor/blender and whizz again until evenly combined. 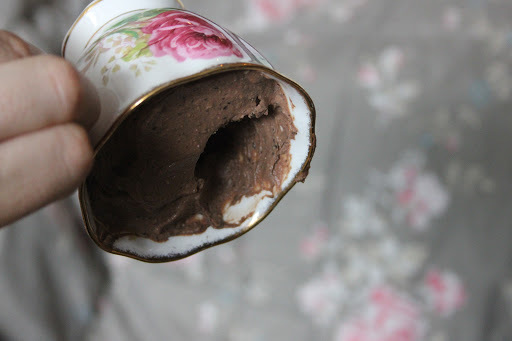 Fill 4 little cups with the chocolate mousse (scrape down the sides of the blender to catch every last drop) and refrigerate for at least 3 hours before serving. * You can use silken, if you really want to, but I prefer firm tofu, as it is much closer to the texture created by egg whites. ** You don’t need to use soya cream. Again, I do because my mother and grandmother would have used cream in their original recipe, but if you can’t find it in your local store or supermarket, just use non-dairy milk or even coconut cream. Variation: add a shot of espresso, or use espresso dark chocolate instead of plain / dark chocolate. What is your favourite childhood dessert? 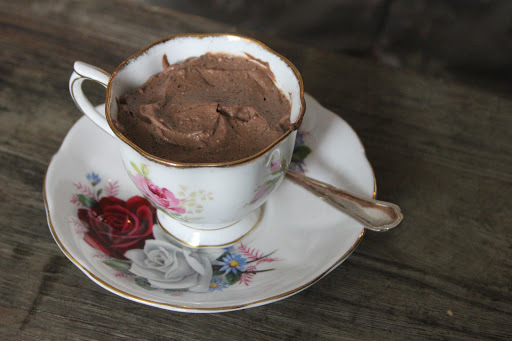 Check out the other recipes from the chocolate mousse series: raw avocado cacao mousse. 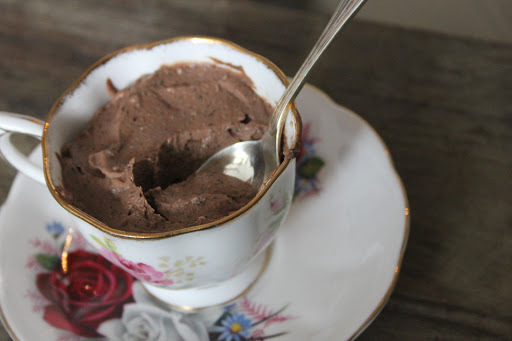 I love tofu chocolate mousse, although I've never tried it with firm always silken so it ends up more like a very thick pudding than a fluffy mousse. I'll have to try your version. That sounds SO yummy! The pictures are gorgeous too. I love that you've used tofu in the ingredients! It makes all the difference! Just be gentle with your blender, you may need to stop and start it a few times and scrape down the sides.